If you're getting bored with your workouts, interval training is one of the best ways to spice things up. With interval training, you push your body out of its comfort zone for short periods of time. Not only will this help you burn more calories during your workout, it makes your workout fly by since you're only focusing on one interval at a time. Even better is high-intensity interval training (HIIT). This kind of training is designed so that you're working at very high intensities during some intervals. Not only does that help build endurance, it increases your anaerobic threshold and gives you a really great afterburn. The afterburn includes the calories your body burns to get your body back to its pre-exercise state. That means you're burning more calories without having to workout more. This workout takes things to the next level by cycling you through three different levels of intensity. During your work sets, which range from 30 seconds in duration to 90 seconds, you will work at a very hard intensity, what would be the equivalent to a Level 9 on this perceived exertion chart, moderately hard, which is a Level 8, and then somewhat hard, or about a Level 6 or 7. You can do this workout on any cardio machine set to manual mode or with any outdoor activity. 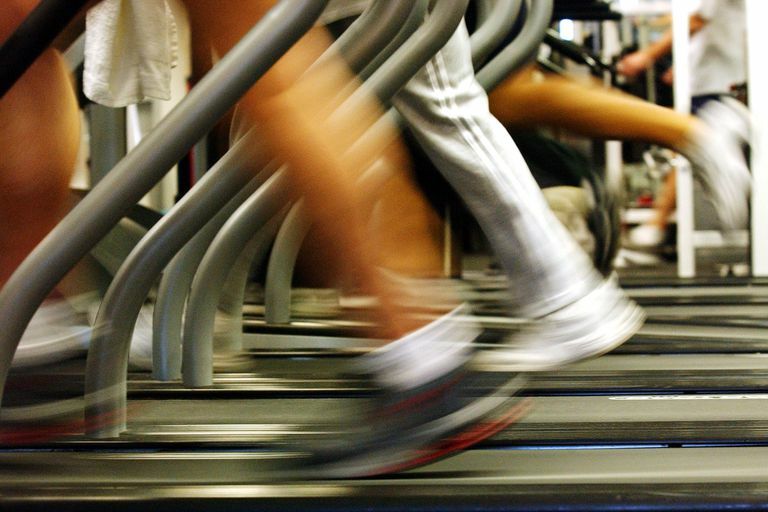 You can use a treadmill, elliptical machine, stair stepper, or stationary cycle. Outdoors, you can run or bike and vary your speed to change the intensity at each interval. If you happen to have hills nearby, you can incorporate those into your intervals as well. Be sure that you have a water bottle with you as this is a long workout and you should be taking a drink approximately at the end of each interval block. Drink whenever you are thirsty as well, and take a good drink of water at the end of the workout. In addition, don't feel like you need to keep the same settings for every interval. As you get more fatigued, you may have to go slower or reduce the resistance in order to stay at the suggested perceived exertion. That's normal, although it can be motivating to try for the same settings each time. This is a high-intensity workout that may not be suitable for beginners. Be sure to consult your doctor before starting an exercise program, especially if you have a chronic condition or health concerns.